TO SPEED THE DOWNLOAD OF THE MESSAGE BOARD WE HAVE REMOVED THE MESSAGES FROM 2001-2005. MESSAGES FROM 2001 through 2005 ARE AVAILABLE ON THE "LINKS" PAGE UNDER "DOWNLOADS." WE HOPE THIS IMPROVES THE WEBSITE. TO SAVE ADDITIONAL TIME THE MOST RECENT MESSAGES IS FIRST. IF YOU DO NOT WANT YOUR PERSONAL INFORMATION (ADDRESS, ETC.) ON THE MESSAGE BOARD, DO NOT ADD THE INFORMATION TO YOUR POST. has contact with Pete Lopez who was from El Paso, Tx. We worked together in the Personnel office. that we may discuss this matter further. greatly apprciated. I look forward to hearing from you. My pop, Clarence Wilson (Wus) Pilchard is looking for his buddy James Dwight Ross from the USS Boxer.They were both Seamen ranked at that time. If you can post to the members of your USS Boxer group, it would be greatly appreciated. Wus can be reached at 410.632.1270. Would like to hear from anyone who has knowledge of the mock air strike against Pearl Harbor lunched May 7, 1948 from the USS Boxer CV-21. My father Col. Eugene F. C. Collier USMC served as G-2 FMF PAC at Pearl Harbor between July, 1947 and March, 1948. Our family lived in quarters at 9 Midway Drive in the Makalapa Housing Area. From my room on the second floor I could look over many of the docks at Pearl Harbor a great view for an 11 year old boy. One morning at about 7AM I was getting ready to walk to the Pearl Harbor Elementary School and my father was shaving. Suddenly there was a load noise and four dark blue jet aircraft zoomed low over our house heading for the Navy Yard. Those were the first airborne jet aircraft that I had ever seen or heard and that was very exciting. My father, who had cut himself with his razor when the jet noise erupted, was slightly less excited. That night at dinner my father reported that the jets (I think from the USS Boxer) were involved in mock warfare between a carrier task force and the Hawaii Air National Guard. The ANG was responsible for the air defense of the Hawaiian Islands. My father was happy that the exercise umpires had decided that all P-47 scrambling from Hickam AFB were declared shot down on their takeoff run by the Navy jets which circled over the runway and made a simulated firing pass on each ANG aircraft as it was taking off. From my research the jets had to be North American Aircraft FJ-1s from VF-51. At that time the battles between the USAF and the Navy were hot and getting hotter. It surprised me that I could find no information on this major achievement by the Navy. Have you seen any written material on this event? Could be some of your older member might remember the event. The only thing I have left to do is to request the Deck Logs of the USS Boxer for May 1948, which I doubt will be found by the National Archives staff. I have included some clippings from The San Diego Union, one of which shows that a mock raid did take place on May 7, 1948. Reviewed 12 major news papers and found no mention of the raid. I haven't been able to find any knowledge of that exercise, Dave, among the few here who might be interested. I agree that someone probably put the word out to shut up about it, but have no idea who or why. I don't think it is hard to predict the results of the attack. 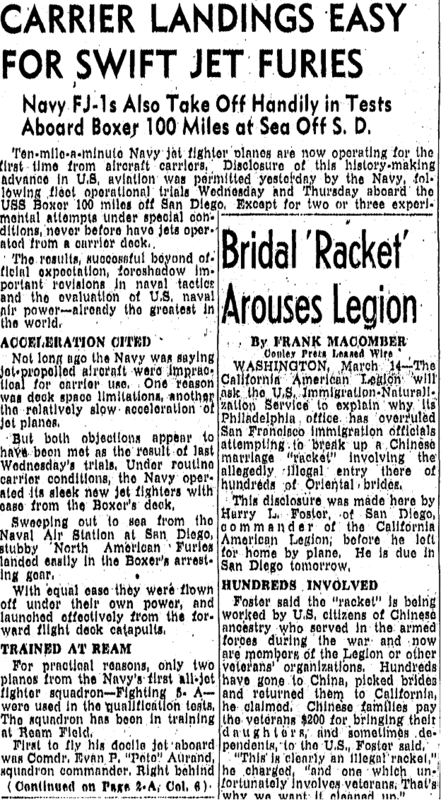 The thing that I find interesting is that seventy one years after the event there has been no mention of the attack in any of major US newspapers, military journals, official reports, Navy veterans' websites or books written by participants at either the carrier/squadron level or at the Pentagon. 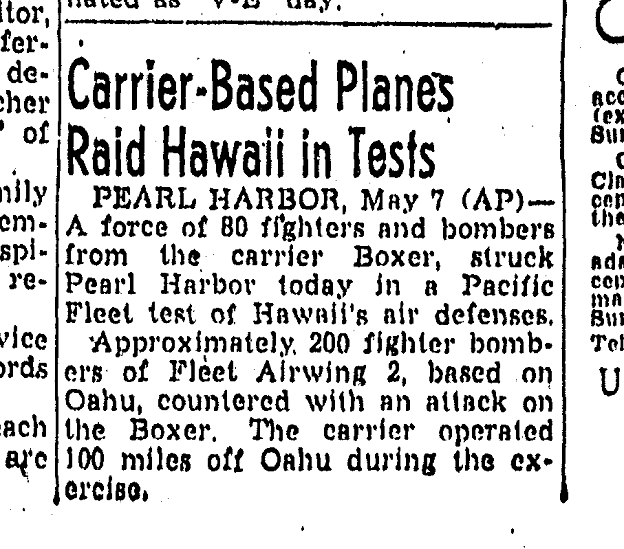 To read newspaper articles about the undetected over flight of Pearl Harbor on 12/7/1948 by an USAF B-50 and never see anything on the Navy jet beating the hell out of the Air Guard P-47s in May 1948 arouses my curiosity. After a small article on the raid appeared in the San Diego newspaper nothing more was seen. Someone at the highest level of the US government must have told the Navy to button its lip in no uncertain words. Don't know what the conclusions were, probably that Pearl was very vulnerable. As for the objectives, it was beat the Air Force and preserve the Navy, I'm sure. ... in 1947 or '48, presumably to test the air defense of the fleet anchorage and base. My brother lived on base that year, recalls the jet make his house shake as they came over Makalapa Heights, and is trying to find out more about it: what were the objectives of the exercise and what were the conclusions. Super Carriers and the B-36 Bombers: Appropriations, Strategy, and Politics By Hammond, Paul Y.
being stored or transported to Vietnam. I served on the Boxer in 1966. I was an electricians mate. We made 2 trips to Vietnam. One through the Suez and one through Panama. We are working with a fellow shipmate by the name of Edward Coker who was aboard the USS Boxer between 10/08/1968 and 08/17/1969. for the decommissioning and the shipyard(s) it was done at. If you have these exact dates and or locations, it would be very helpful! Maybe if you do not do you know someone that I could reach out to that could assist me? I hope this finds you well. My name is Kimberly. I work for a personal injury law firm that represents a former USS Boxer shipmate’s family in an asbestos case. The former shipmate’s name is Charles Oren Pendleton. He passed away in December and is not able to give testimony of his exposure to asbestos containing products on the USS Boxer. time as our client, I would greatly appreciate it. Thank you. on the Boxer during that time. How could I possibly help my father to procure contact information on Mr. McCormick assuming he is still with us? My name is Avid Rose and I am a paralegal at Weitz & Luxenberg. We are looking for a shipmate who may have known our client, Richard Kraus. I found your name and others listed in this email on ussboxer.com website and any help you can give me would be greatly appreciated. Was there a cruise book for that year? Is there any membership list that would indicate years so that I can contact individuals that may have known Mr. Kraus. Thank you in advance for any assistance you can offer on behalf of Mr. Kraus family. On this veteran's day, I wanted to thank you for your service. My dad was on the Boxer out of San Diego in the 50's. His name was Joseph Hammond Loving. Hello, I need some information and hope that you can be of assistance. colors of the aircraft that operated off of the Boxer during the VietNam war. but it is not hi res and we really want to be as accurate as we possible can when we debut this plane next year. Any information that you or your shipmates may have would be greatly appreciated. I was on the USS Boxer.from 1960-1962 and was trying to locate a McDonald. Can you help? I was in E division , an electrician in the lighting shop from 1960-1962. The McDonald I knew was discharged around 1961. He then went to Bible College. I'm still trying to recall his first name but at 73 things have wandered off. test itself, but rather the experience of being in the Marshall Islands at that time, etc., as told by an eyewitness. found something that mentioned you's had a web site like my husband has a web site for his group of vietnam veterans. to get the pictures. Someone must have news reel in archives somewhere. Am really desparate to find this for him as a Birthday Surprise! Thank You. Hello My name is Joe Shepard and I served aboard the Boxer in 1953 and 1954.
for cruise photos or possibly a duplicated book. His name was John P. Masella. He graduated from The Keel, training commenced November 1960 and I believed ended January 1961. I have all of his discharge paperwork Any help or any suggestions are greatly appreciated. My name is Jim Castle. I served aboard the Boxer in 1945 and 46 my nickname was Casey. I was a member of VT 93 squadron and my pilot was Wes Nowell. I will be 90 very shortly and my phone no. is 716 531 5806. I would like to hear from any of my shipmates, if they are alive. My dad Ed Turner served on the USS Boxer Feb 1958 - Dec 1860 as a RM3. He wanted his info to be added to the message board and wanted to know when the next reunion is scheduled. It was a special time for him and all crew members during their time aboard. He also was trying to find Mr. Jim Moore, in Marine Radio Comm. about the prospect of getting in touch with some of his fellow shipmates. If you served with him please email me or call me so I can get you in touch with him. His name is Ira T. Crisp and was an aircraft mechanic. I believe he served between 1950-1954. He also did a tour on the USS Yorktown. My father, Ardwin (Art) Schneider served aboard the Boxer 1945-46. I think that he was a communications officer, an Ensign or Lieutenant. He passed away in 1999. I recently found a diary he kept of his time in the service. It had some facts (ports of call, weather, plane crashes) but was short on stories. If anyone here remembers him, I would be happy to hear from you. I was an RMSA in the Radioroom. Would like to hear from any Radiomen who would have been on the ship at that time. I would like to hear from anyone that was aboard from 1956 - 1958 in A division. 1955-1956 Cruise Book. Mr. Groden can be reached at 918-749-4803, by e-mail at dgroden@swbell.net, or by mail at 5533 S. Cincinati, Tulsa, OK 74105-6705. I am trying to find any information I can on my grandfather; James (Jim) Russell. He served on the USS Boxer from 1950-1954, from what I have been told. He passed away back in September of 2011 and I am trying to find what information I can about him, photos, anything. If you can help, I would greatly appreciate any thing you can do. My dad Nelson Miller Jr. asked me to post something on the message board, if you could do that for us that would be great. Anybody on duty boxer sickbay August 1951. If you remember at this time that a sailor fell down a ladder and his ankles turned black. the Dr. said to pack them in ice and elevate. He was in bed for one week and warped his left hand. Note: at this time Mae Craig was visiting for Meet the Press the TV show. I served on the original Boxer CV-21 from 1946 - 1954 Division A MM1. Has anybody else served that long on the Boxer? I am in contact with three shipmates via e-mail, and enjoy talking with them. Often wondered how many of my crew are still living? I am 85 now and would like to hear from any members of my old crew. Take care now. I am looking for anyone who new (and can remember) my dad, CW04 Alfred Baran. He served aboard 1955-1956 as Chief Photo Officer. My father, Donald William Simmons, served on USS BOXER during WWII as a diver. He passed away in November 1987 and he didn't tell me a lot about his service and I'm trying to find out more about his time on board. I'm looking for a digital copy of the artist rendering of the USS Boxer, which done in charcoal. If anyone help me locate a copy of this drawing, it would mean a lot to his family. If anyone knew my father I would love to here from you. I served on the Boxer as ships company from November 1967 to 1968. I was in the Communications Division. I would like to hear from anyone out there who might remember me. Bob Niederhauser is looking for the family of "Gordy", Medical Div.,CVS_21 1955 or after Mr Niederhauser has a shaving mug with the Medical emblem, CVS-21 and "gordy" on the side. He would like the family to have it first or then donate it to the LDH-4. E-mail bnieder@mchsi.com or phone 319-352-2025. Was on board the Boxer from Feb 52 to April 54. Anyone in the forward engine room during that period of time, I would like them to contact me. I'm looking for information on my father, Robert T. Duffy. He served on the Boxer sometime in the 40's and I'm hoping someone out there remembers him? My father, Robert T. Duffy, went to be with the Lord on April 3, 2001. I just did a dumb thing, I sent an E- mail a few minutes ago looking for a lost ship mate and I didn't give you his name. He went aboard the Boxer in 1955. His name was William "Bill" Brand, from Austin,Texas. He went to "E"div. and I went to "E" div. on the Badoeng Strait. Haven't seen him since 1956. Hope you have him listed on your list and can connect us some how. ADDRESS: 4-B Marsh Harbor Dr.
Hi My name is Vince Jennings. Served aboard the Boxer V6 division 1952-1954 (2) Korean cruises. Boarded the Boxer in San Francisco,Hunters point naval shipyard.I would like to hear from anyone out there who might remember me. Hi, my name is Stephen Kimball. I was on the boxer in Jan. 2 1966 till oct. 28 1969 R Div. D.C. shop. with some of you guys not too mention Hong Kong. Enlisted 1951 regular navy at 17 on a "kiddy cruise." I went out on 1953 tour to Korea attached to Composite Squadron 11 (VC-11) as aviation machinist mate (AD). Was a plane captain. Serviced and maintained my AD-4W Skyraider. Best all-around aircraft ever built. Our planes had a big radar dome underneath. They flew Air Cap, providing air early warning and intel to fighter aircraft. I still have my cruise book and squadron patch. Saw several planes land with holes in them, a few crashes, hung ordnance come loose on landings and planes tossed overboard because too damaged to repair. One AD came in too high, missed hooks, hung landing gear on cable barrier, flipped over and engine tore off. We were able to lift plane by hand so pilot could drop out uninjured. His helmet was scraped a little. The Sky Raider could take off with ordnance that weighed more than the plane. With a full load, when they took off, they would disappear below the level of the flight deck then slowly rise with a slight turn to the side. I later extended enlistment a year to make a Med Cruise on the USS Hornet and then on the USS Philippine Sea with remaining time. My squadron was based at NAS North Island, San Diego. What I learned in the navy has served me well all my life. Charles Carter OS-1 USNR ret. Long story about reenlisting in the reserves and going from aircraft mech to Operations Specialist and making two week cruises on many different ships. My service record is as thick as a book. You may edit this as it suits you. I served aboard the USS Boxer(CVS-21) in 1957-58, I don't remember specific months. I know the ship was in dry dock at Puget Sound Naval Shipyard when I went aboard. Following refitting she went down to her home port in San Diego. I was an Aviation Storekeeper (AK3) serving in Supply-ARI. I would be interested in hearing from anyone aboard the Boxer at that time who also served in ARI. Hello. My name is Fred Hetu and my Dad served on the USS Boxer as a SN from Oct 1952 through May 1954. His name is Leo Hetu and I was hoping some of his shipmates may remember him for old time sake. He speaks fondly of his service in the US Navy and if anyone can help contact me at fredhetu@cox.net He is a Massachusetts resident. My name is Alvia (Bub) Smith and I was aboard the Boxer from Aug 1963 to Aug 1964 in E-Division. Just looking for some shipmates in this division at the time I was on board. Would like to hear from you. My e-mail is ssmith@rtcol.com. I was wondering about two in specific: Michael Demming and John Meager. Thanks for any info you can provide. Radarman. Looking for any contacts from that time frame. were in our division,and I should have done a better job of staying connected. I found your info in the VFW magazine. I am writing in regards to my wife's late father Charles Camara serial # 7991669 , who was an aircraft mechanic on the USS Boxer CV21in Feb 1951. She has his medals but no photographs of him in uniform. I am hoping somebody at your reunion may have known him or at least somebody would have a photograph of him in uniform she could put with her medals. We would appreciate any assistance from any of the reunion folks in this matter. I was evacuated from Santo Domingo, Dominican Republic in 1965 from some field near the US Embassy and taken to the USS Boxer. Anybody out there served on that ship at that time? I'd like to thank whoever it was that played two square, basketball, gave me Dentine gum and took me to the doc when I got a nosebleed. I was 8. Let me know. I'm looking for information on my great grandpa, Captain DF Smith. He was the CO on CV-21, maybe somebody out there knew him? My Father served in the U.S. Navy in World War II. The time was 1944-1945. He was a radarman from Georgia. His name is Adrian Dwight Massey. 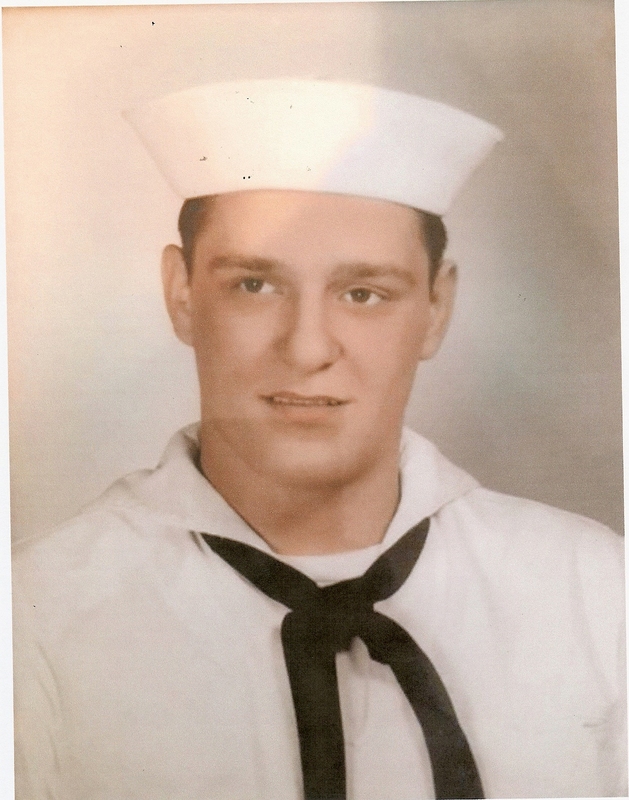 If you served during this time and recognize my father as a fellow seaman, please e-mail me at the above address. My Dad, William Milbach, was on the CV-21 Boxer between 1944 and 1946. He died in 1981 when I was 12 so never really got to hear some of the stories he had to share. Anyone who remembers him please email me. I'd love to know what life was like on this tour. Thanks to everyone for sharing your histories on this site. I've gained much from that. Looking for a copy of a picture/cruise book page etc. - suitable for framing that shows the Naval Aviator's wings that hung on the bulkhead of the Officer's Wardroom of USS Boxer CV-21. Would like to place this picture next to the original wings. If anyone has such a picture - please contact me. Thanks. CDR Bob Dupuis USNA '79. My Dad, Roger Mathieu served on the USS Boxer attached to Fighter Squadron 63 from January 1,1950-April 1, 1951 and on the USS Valley Forge from November 1951-May 1953 and the San Pablo from 1944-45. I believe he was a Chief during this period. Sadly he passed on August 15, 2007. He was so proud to serve his country. He spoke often of this tour. I have pictures with the following names mentioned- Alerich, Clayborne, Montgomery, Christian, Foster, Mills, Perkins, & Maddox. I'd be happy to forward. If anyone remembers him, please contact me. Thank you. It is with great sadness that I report the passing of my father LCDR Charles B. Sturm on March 12, 2007. He was aboard the USS Boxer (CV-21) attached to Sqdn VF 142 when it was deployed to Korea in March, 1951. He shared stories with me about his time aboard the Boxer and displayed a fondness for the ship and its crew. I was in V-4 division from 1963 until 1965 and made 3rd class Avialtion Administration while ship was in santo Domingo picking up US civilians. Was flown off to Air feild in Santo Domingo and home to NAS Norfolk and VAW-12 Squadron. Had a great time on Boxer and loved going from Norfolk to Virgin Islands for 3 month tours. Rough Duty!! Great Home Page! I'm looking for a friend who served aboard the Boxer about 1958-1960. His name is Gerald Wolf (or De Wolf). The last time I saw him was on the flight deck when I visited him from the USS Pocono (AGC 16) just before he was discharged. I would like to contact him if possible. Thanks, Bob Malain QM2 (I didn't find a crew listing at your site). I am looking for a friend, Charles T. Benton "Charley", who was transferred to the USS Guam on Sept 4, 1969. Service Number is B61 96 94. Does anybody know where I can locate him? I'm not sure if this picture is something you would post on the association web site, or not, but here it is. 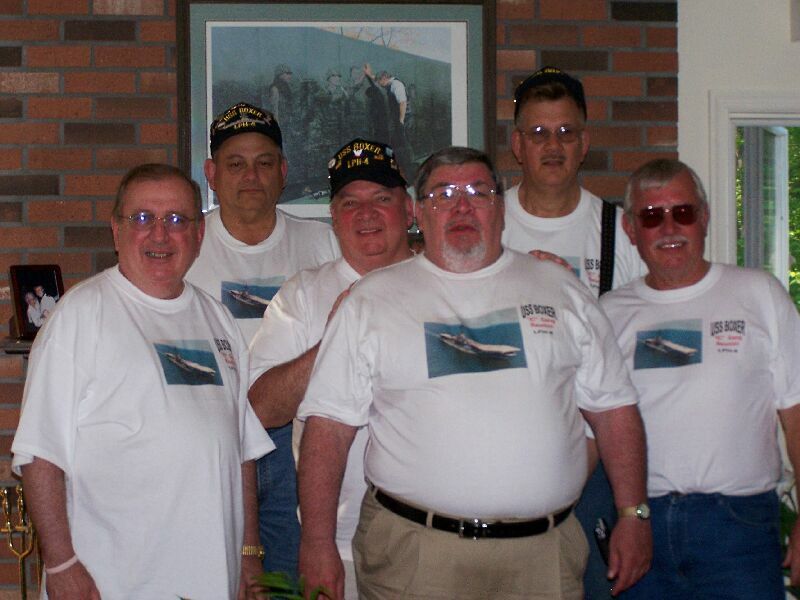 Six guys from the IC gang of the mid-sixties got together on May 7, 8, and 9 in Maryland. We had a great time reminiscing, and are planning to do it again next year. We are looking for more IC guys that served w/us for next years get-together, @ a time & place to be determined. A posting on the Boxer web site could help us out. If you decide it's appropriate to post the picture, and names, feel free to put my e-mail out there, too. The guys are, left to right, Mike Mc Nelly, John Hodorski, Jim McKeon, Jim "Bud" Claycomb, Ernest Filomarino, and Jack Luther. Thanks a lot, and I'm looking forward to seeing you in San Diego. Shirley Allen Norquist, my father, was on the USS Boxer from 1950-53 during the Korean War, and he may well have been one of the photographers who took pictures of sailors shopping in Seoul on "Remember When," as he left behind photo album with very similar photographs in them, and he was one of the Boxer photographers. He died in 1980, and was from Huron, SD. His nickname was "Shirts" and he was 5'8" but very tough and wiry. I would appreciate hearing from anyone who may have served with him. My name is Jeffrey Ricks, Ltcol USAF (Ret) and I found this site in the reunions section of this month's "Military Officer" magazine. My father proudly served aboard the Boxer (CVA-21) as an A-1 Skyraider mechanic assigned to VA-145 and was aboard for her 1955/56 Far East Cruise. I still have his cruise book and it is still in pretty good shape. It went through a flood and the binding is shot but the pictures are all in excellent shape. There are some great pictures of operations and crew along with some amazing hand-drawn artwork of "The Indomitable Lady" If anyone remembers AD2 or ADR2 Ewell E. (Earl) Ricks, I would appreciate hearing from you. I remember every story he ever told about that cruise and the pride he felt as part of such a magnificent crew was a large part of him until he died several years ago. His time aboard the Boxer became and will always be a part of my life. Thanks. Would Like to hear from Marines who served on Boxer from 1961 thru 1963. I was in V6 Division during this period. I was a plank owner of the USS Boxer. I left the Ship in Saipan in the Spring of 1946. I served in the H Division. Like to hear from any of you guys. My name is Grant Woods. My Dad Kenneth Woods served aboard the Boxer from late '56 through '58 in V-1 division. He is doing good and says hello to all you old salts out there. He has found a couple of his old buddies but is still looking for James A. Purl. If anyone has any information on Mr. Purl please contact me and I will pass on the information or if you remember my Dad and would like to say hi let me know. He also wanted to say "Hey Rodney Keaton give Kenny Woods a call!" He does not know this, at least not until he reads this, I would like to find any cruise books or pictures that anyone may have from this time frame as my Dad lost all of his stuff in a fire in '71. It would mean a lot to him I am sure. Thanks in advance. My father, Clifford J. Breedlove, crewmember of the Boxer during the Korean War, passed away in 1996. If you served with Shipmate Jack V. Welch during the period of 1/1/1960 to 12/3/1964 please contact me. He died of cancer from asbestos. I represent his widow and am assisting her in determining which asbestos products he was around. Thank you! ADDRESS: 1699 rue Arthur Fecteau St. I recently learned of your organization and wish to inform you that I served on the Boxer for only 6 weeks during March-April 1955 in the medical department to assist in the fleet training exercises off the coast of California. Since I had been through the training twice on the USS Hornet and I was due to be released from the Navy shortly, they sent me to the Boxer to provide experience to the new members of the medical department staff. I was an HM2. I served on the Boxer as a seamen in 1947, & have a few pictures of plane crashes and a great picture of the boxer, just leaving the Golden Gate Bridge. It was a great ship, Ring was Captain when I served. My grandfather was a crew member during one of the Boxer's tours to Korea. Stanley J. Marshall is his name, and I am pleased to see that you have created a website about the ship. He use to tell me stories about the ship when I was younger. I want to say thank you on his behalf for creating this website and to keep up the good work. Hail Fellow shipmates!!!! I was aboard from July "67" until Feb. "68" I was in V-1 Division, ABH-2. My last ship. I was discharged in Jax. Fla. Had good times aboard her. I found your site while plowing around. Thought I should say something. I served on Boxer from april 64 thru feb 68. I was in OI division and left the ship as an rd2. I saw where Adams of nebraska had logged in and thought I should also. Currently I am an elementary school teacher here in West Virginia. ADDRESS: 219 N. Charity St.
My uncle Clyde E. Shofstall served many years in the Navy and many of those years was on the Boxer. He has passed away several years back. He was a hero to me. If anyone knew him and has any stories to share please contact me. Thank you! I have really enjoyed this web site. I would like to hear from any one in the E-Div who served aboard the Boxer from 1949 till 1952. I would like to hear from any one that was aboard the Boxer from 1956 to 1958. I was in A division in the forward emergency generator room diesel gang. I am also planning to be at the San Diego reunion. Hope to hear from you soon. My father served on the USS Boxer after the war in 1945. His name was Cyril Windholz, may have gone by the name of "CY". He did not talk about his time in the Navy as his kids were going up. If anyone has any information, I would greatly appreciate if you would contact me. My daughter just came across this website. My husband Thomas Hedrick, was aboard USS Boxer and USS Knapp between 1955-1959. He recently passed away Sept. 8, 2006. I just thought it would be nice to hear from anyone who served with him. If you could contact me or have anyone who was on the ship at that time, contact me it would be great. I have a lot of pics and I don't know who a lot of the men are. I would be very greatful. Thank you to all. Dear Crewmen of the Great Boxer: I have a friend for many years with last name Pontisen. He said his Dad was on USS Boxer in WWII. He would like to know if anyone knows him. I was very interested in that since I was aboard the USS Intrepid in 1968 to 1970. His Dad is still alive in Florida. Hope someone knows him. Like you site very much. Sincerely, Bill Townsend. ADDRESS: 10332 W. Brookside Dr. Anyone from VF-194 attend this reunion? I am Roy A. Erwin, AT in VF-194, on the cruise aboard the Boxer in 1953. My e-mail address is roypud@hotmail.com, and my home phone no. is 623-876-9249. Served on boxer 61/63 in R Div. would like to find mates JIM VARNER (TX) W O PUCKETT (WVA) and a PFC LEROY SEITZ (NY) Roy was with troops that came aboard during the Cuban operations also ROBERT ROMANINI (OH) JOE WEIDGER (PA) can u help? I am trying to replace my fathers (Rodger D Jones ) and uncles( Edward L Angel )shellback certificate. They both served on the Boxer when it crossed in Feb. of 66. This is the only information I have been able to locate. If someone still has their certificate or the actual date and crossing point information or even a photocopy it would be greatly appreciated. I'm trying to locate, and get in touch with Harvey Neumann, who served aboard the USS Boxer in 1947. Please anyone with any information, contact Viola Neumann Lane, 1443 Hanover Ave., South Meriden, Ct. 06451 or call 203 639-8953. Thank you for your help. I WAS ABOARD CV-21 BETWEEN JUNE 1953 TO ABOUT NOV 1955. I LIVED IN LA, WORKED IN MOVIES, THEN I STARTED WORKING IN AEROSPACE IN THE EARLY '60s. I AM PRESENTLY WORKING FOR THE BOEING CO. ON THE C-17 CARGO PLANE. I served aboard the Boxer in V-5 division during Operation Hardtack.. I would like to hear from anyone who was in my division at that time. I served aboard the Boxer during the years 1959 to 1961 in the "OE" division as an electronic technician. I left the Navy in 1961, subsequently went to college, graduated eventually from State University of New York at Oswego in 1967 and taught mathematics for 31 years in Oswego, New York. I am very happy and proud to have found a connection to the Boxer. I think our ship never had the notoriety of some of the other ships, but was an important part of our Naval history. My father Steven Carroll Sexton served on board the Boxer during the Korean Cruise of 53 with VF-52 and is looking for some shipmates that served with him. Elmer Thane Collins, Sun City KS., Macio Brown, Omaha, NB., Leonard Hall, Columbus, OH., Robert L. Schoenhoff, Louisville, KY., Anthony C. Machela, Detroit, MI., Lloyd M. Ballard, Jacksonville, TX., Thomas P. McDonald, Slayton, MN., and Jerome C. Soboleski, Chicago, IL. These are some folks he would like to catch up with and their original home towns as listed in the Cruise Book. Any information any members could provide would be greatly appreciated! I just visited this site and was shocked to see the Army Mule on the Fantail. I can remember as if it were yesterday when the ships First Lt. LCDR Henry Remsen hunted me down to Pipe the Damn Mule over the side! It even had 4 sideboys! But I was promised that we would exact revenge for this rendering of honors to a Mule. He was a man of his word! And if I remember correctly, the Captain took him of the Watch Bill as the higher ups did not care for the branding. When we got back to Norfolk the Virginia Pilot had the Headlines Flank Hero Returns Home! Thank you very much for allowing me to post my previous message looking for information on the death of Capt. Donald F. Smith. In my continued research, I did uncover the fact that he died in Coronado, Ca. 13 March 1991. He was buried with his wife Sophie in Ft. Rosecrans National Cemetery. Capt. Smith entered the service 2 June, 1921. He retired from service 30 June, 1951. Capt. Smith was born in South Carolina 2 June, 1900. He was the son of the Governor of South Carolina. After graduating from the academy, he earned his wings in Pensacola and soon after married my Mother, Lottie Pitt. I wish all of your members the very best and I thank you again for allowing me to post my messages. Sincerely, Joseph T. Thornton Pensacola, Fl. I believe that I am about to come into possession of the gold Naval Aviators wings that hung in the officers wardroom of the Boxer before she was decommssioned in 1969. Does their exist any photos of the wardroom that might show these so that I can verify the authenticity? Thanks.......Bob Dupuis Commander USNR Ret. My Father, Michael “Jack” Dollaghan served on the Boxer during the years 1944-1946. I would like to get in touch with anybody who might have served on the Boxer at the same time as him or might have even known him. If you have any information, please call Mike at 303-776-7140 or email me at cdollaghan@hotmail.com. I was on the USS Boxer for about 3 months and I loved every minute of it. This was because I was in the Marine Corps and the ship was my ride home from the war in Iraq. I ran in to this site by accident and I'm glad I did. Thank You. This is for George Perkins ABH3. I can't put a face to the name, but the name is familiar. I too worked in V6.Spent many many hours on a tug dragging that metal contraption around the hangar deck. If I remember right, we used powder graphite to shine it. What a mistake! made the deck like glass. Almost lost a helo over the side because of it! I am a past president and currently membership chairman of the USS Hancock (CV/CVA-19)Association. We have about 1,400 members. I'm interested in exchanging information with the Boxer organization. For example, I send our quarterly newsletter to the Forrestal Association, and they send theirs to me. I currently send our newsletters to reps of Shangri-La, Bennington, & Oriskany. Also send our newsletter to the carrier museums: Yorktown, Intrepid, Lexington, Hornet, Midway. Do you publish a newsletter? Someone contact me. Also on a personal note, I have a question. What was the radio call-sign of Boxer during the Korean War? I was over there in 1952-53 aboard Kearsarge. We were "Banknote." Essex was "Undermine." Bon Homme Richard was "Trustfund" I believe. Someone was "Passbook;" I believe it may have been Princeton. I served on the Boxer from March '65 to Feb '67. Was in V4 Division but worked as Air Office Yeoman along side Richie Queen (V1) and Tom Dinofa (V6). Would like to hear from anyone who remembers me, especially Richie and/or Tom. Looking for information on RM3 Robert Harrison who served with me on the Boxer from 1948 through the middle of 1952. Was from Evanston, Indiana as I recall. We spent our navy hitch joined at the hip. We attended the same Boot Camp company, were transferred to the fleet on the USS Antietam, then the USS Bairoko and finally to the Boxer where we spend the bulk of our hitch. Lost contact, and any info would be appreciated. Thanks. Prior to the Korean War, the Navy was hard pressed to provide money for at-sea training cruises and exercises. This shortage was not lost on the crews, and some poetic soul constructed a poem that began. "A year ago today, we got underway and moved 100 yards up the dock!" Got to thinking about it the other day, and wondered if any of you recall the poem and...Please God!...remember how the rest of the piece went. Thanks in advance for thinking about it, and for supplying it...if you can. Cordially. Richard R Hall, QM3, ON Div, 1949-52. Looking for pictures of the USS LEO AKA 60 taken from the Boxer during 1950 to 1954. Bigsteve47@aol.com Ref your message on the message board, though I did not know Tony Russo personally I did meet him once and through the meeting he arranged to ride with me and some other New York City area shipmates. I am Larry Adams RD3 OI Division 1963-1966 USS Boxer. If any shipmates care to communicate I can be reached at adams606@kdsi.net or 402-564-9035. I am looking for information on my Grandfather Donald Edward Peters Sr.. He served on the USS Boxer during World War II. I appreciate any information that you would have, I have never met him due to his passing before my birth. Even if you could possibly direct me to someone who could be of help it would be greatly appreciated. Thank you so much for your time. My father John J. Montano served on the Boxer CV-21 from 1944-46 I believe. He was known as Monty as far as we were told. I was wondering if anyone had any information or remembers him. He passed away in 1985 and anything anyone can pass along would be great. He had lots of great memories of his service onboard and I would love to hear back form any of his shipmates. I was aboard the Boxer from 1944 - 1945, and was member of the A Division - #2 Boiler-room. Would really like to get in touch with anyone who might have been in the same Division during that time. Great website I was aboard the "B" from march of 65 to sept 67, 2nd div. I am looking to talk to any shipmates that remember the "Possem" from the latter pocket and the boat boom operator. djrslk@rochester.rr.com Lt. Joel J. Phillippi, you still around? I am still looking to find a cruse book from when we crossed the equator in feb 66. Paid for it never got it as was transferred to RVN before it came to the ship. Still have receipt and have tried to find the company that put it out but no luck in finding it. They seem to have gone out of business since then. LCDR Remsen...the best shot man with the shot line gun I ever met... A lot of fine memories from the "Busy B" Who remembers BOSON Sparks WO4? David "Possem" Russell BM3, 2 nd div. Operation Hardtack, 1958. Served aboard the USS Boxer, 1957 thru 1959. ADDRESS: 1600 Prairie Run Cir. My father, Richard Duane "Bart" Bartholomew, served on the Boxer in the mid-1950s. He passed away in 1994 and, with the exception of a few vague references and stories, he never really talked about his time in the Navy. Now that I am older and in the military myself (Army - Sorry, Dad), I would like to know if there is anyone out there that served with him that could talk with me about what he did and what life was like aboard the Boxer at that time. I appreciate any help I can get. My name is Terry Berthold, my twin John and I were on the USS Boxer from 1964 to 1967. John was damage control, I was a commissaryman. We played in the Rock and Roll Band. Their names are Ken (can't remember the last name) on Sax and Keyboard. Jerry Lilly on lead guitar, Don Wilson from West Palm Beach. Would love to hear from you. John is looking for a guy named Puglese from Utica NY, he worked in the carpenter shop and Chief Petty Officer King. I also worked with 3rd class Gino commissaryman. To all the guys, hello from the Berthold's. Copyright © 2000 by [USS Boxer Veterans Association]. All rights reserved. Revised: 11 Feb 2019 19:47:27 -0500 .